In 1918 Paul Klee did a painting which he named “Sunken Landscape”. He related to the Moon of the South who told the story of the Moon of the North, his uncertainty, his quest to find his bride, his other self. The more one looks at the painting, the more one gets sunken in the emerging layers of the landscape. It is the part of the day when Moon is up in the sky and down in the water having it’s daydream. Moon of the South dreams of the Moon of the North while the Moon of the North remembers of the Moon of the South. 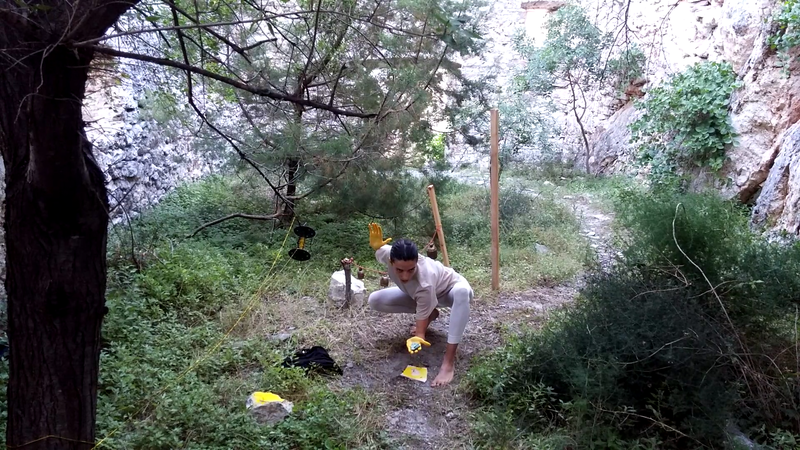 Moon’s Daydream is a performance I created in spring 2016 for the performance in the ruins of monastery “Dračeva Luka” on island of Brač, Croatia. The monastery was built under the rocky hill, belonging to the dominantly stony area, very close to other two leftovers of monasteries, one in the cave, other on the other side of the hill. Although built of different centuries, they were all interconnected in most hidden ways. In the Moonlight that was, for me, somehow easily recognizable, in the daylight not that much as the sun is very strong and and stones radiate the heat. Under the influence of these natural lights, the landscape witness different realities. These realities are interconnected and embraced by the landscapes that exist simultaneously. Many things that occurred among people there were left hidden as not acceptable by social norms. Paul Klee’s painting (visible at this link, https://ivakorbar.weebly.com/mjese269evo-sanjarenje.html) has it all. I, as a performer, play the intercommunication of these various testimonies.